In just over a week, Dublin will welcome another world-class sporting event! 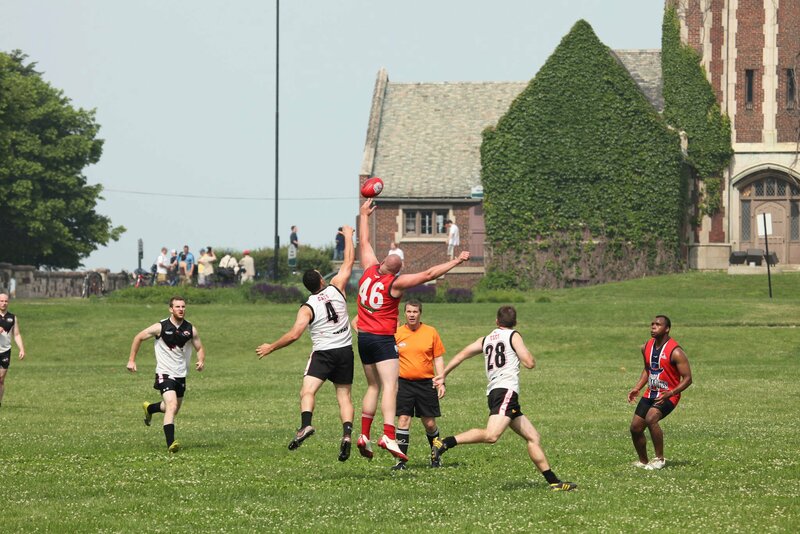 On Saturday, August 4, the United States Australian Football League’s 49th Parallel Cup will take place at Darree Fields Park (rain or shine). The Dublin Convention and Visitors Bureau worked alongside the City of Dublin to secure the event. The organizations submitted a national bid to host the competition and beat out other cities such as Ft. Lauderdale. The tournament will pit the United States National Team against the Canadian National Team. There will be four games total, including a Women’s B-side, Men’s development (for players under 25), and bouts between USA Freedom and Canadian Northern Lights and USA Revolution and Canadian Northwind. Games will begin at 10 a.m. and continue every two hours; the last is at 4 p.m. The event is free and open to the public. Food and beverages will be available, and spectators are advised to bring lawn chairs or blankets. The game is played on a cricket oval, so there are no standard dimensions. 18 players make up a team. Three substitutes are allowed on the bench. There are 5 general areas of play. They are referred to as “lines” and include: Full Forward, Half Forward, Centre Line, Half Back, and Full Back. A game is divided into 4 quarters with each consisting of 20 minutes of playing time. The ball advances down the field either by kicking or hand passing (using a fist to hit it). The ball must be bounced or passed every 15 meters. There are four posts that make up the goal – the goal posts (tall and central) and the behind posts (short and outter). Six points is awarded if the ball passes through the two larger goals posts without being touched. One point is awarded if the ball passes the behind goal posts. The team scoring the most points wins! Dublin will also host the 2013 National Championships. For this and other event information, visit the Dublin Convention & Visitors Bureau website at www.irishisanattitude.com.